Dorothy Parker was born on August 22, 1893 in New Jersey, my home state. (Maybe thatâ€™s why sheâ€™s my favorite modern, dead poet!) Actually, I rediscovered Mrs. Parker, (as she called herself, keeping her first husbandâ€™s name) while going through my own divorce, because so many of her witty, caustic poems about men reflected my feelings at the time. On my own birthday in 1995, I dressed up ala Parker and read her poems and a short story at a bookstore in State College. 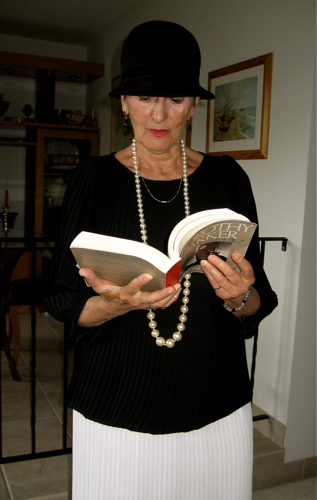 (Several women also came dressed in 1940s clothes and hats. It was great!) I was single, dating, and hesitant to become involved again, so Dorothyâ€™s poems really spoke to me. 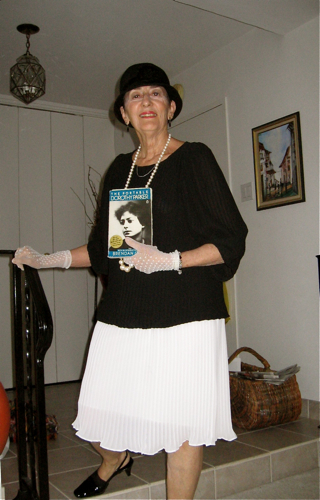 (Here I am, today, dressed in my Dorothy Parker “costume,” which I wore when I read her poems in 1995. I keep the dress & hat for sentimental reasons.) Thanx to hubby Alan for taking these photos on short notice. One of the ads used to promote the movie. 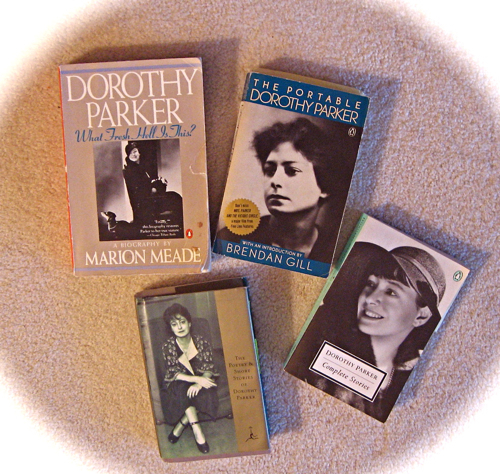 The Poetry & Short Stories of Dorothy Parker is divided into two parts. First are the more than 175 poems subdivided into: â€œEnough Rope,â€ â€œSunset Gun,â€ and â€œDeath and Taxes and Other Poems.â€ The second half consists of twenty-four of her short stories, of which she was a master at writing, having helped to introduce this genre in the early days of The New Yorker magazine. content to bask in tears & pain. Exquisite torture seemed her goal. Words of passion seared her soul. Covered what she felt so much. she carved a path of clarity. I pen a rhyme that’s tough and gentle. no matter, Dorothy, thanks a lot! 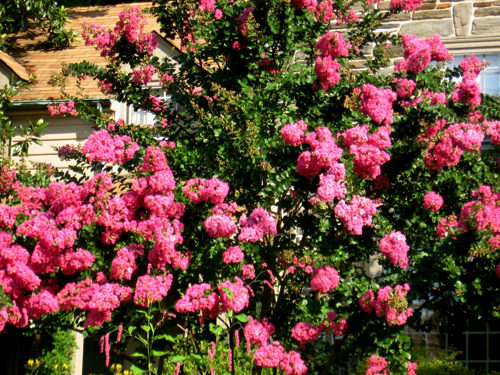 This entry was posted on Friday, August 21st, 2009 at 8:00 am	and is filed under Reviews. You can follow any responses to this entry through the RSS 2.0 feed. You can skip to the end and leave a response. Pinging is currently not allowed.